The navgrids wouldn't be ideal for this, they only store weights rather than actual tile data. If you're looking for a lead-in point for roads, the Start Markers placed at city gates are a natural termination point. And from there you can use the in-memory tilemap for the location to connect roads to the nearest available road tiles (index 46). Unlike the navgrid, this map has full tile information (even stuff like corners) and would be lot nicer to join with. The navgrids are made by combining an inverse of the automap to carve out space for buildings and then weighting by tile type (e.g. NPCs might prefer nice roads over dirt). It's a pretty cool resultant set of data though. I'm seriously considering having the 3 major cities professionally printed and framed for our gaming space. I see, now that you say it the tile map has already the informations i was thinking about. The start marker seems a pretty solid info point for this purpose, hope this mod get improved to support this, one day. Yep, they have an interesting look. Did this implementation of roads ever go anywhere, or did it stall? Is anyone still working on it? Do we have access to the RoadEditor & Roadmap reader? If it's a case of doing mind-numbing work connecting walled-settlements with roads (and lesser settlements with narrower roads, and other locations with dirt-tracks), I'd be happy to help. EDIT: Also, is anyone working on updating / re-drawing the global & travel maps? 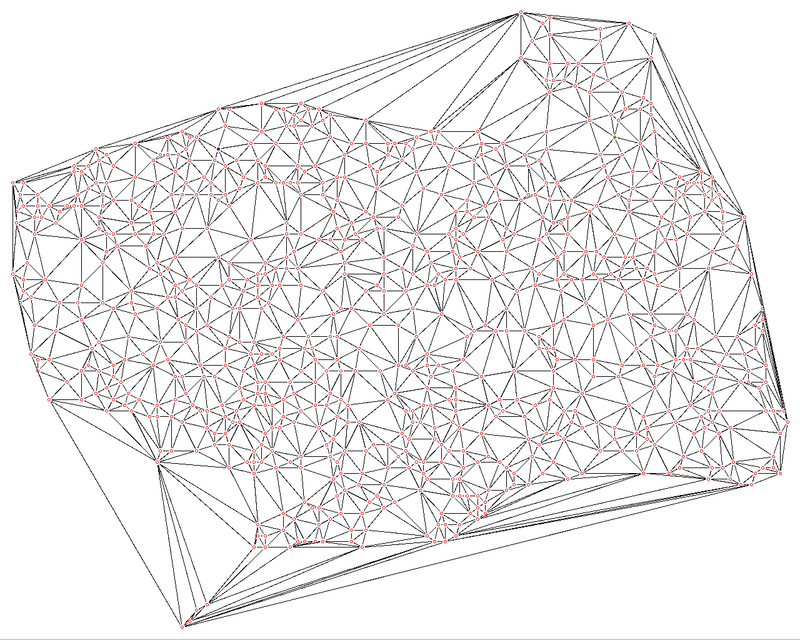 I'm not a specialist of graph questions, but I think what you're probably looking for is the dual graph of Voronoi diagram, in other words Delaunay triangulation. Last edited by pango on Thu Aug 09, 2018 2:57 pm, edited 3 times in total. Also, Ive seen quite good global maps remakes as well, one is sitting on my HDD, so its doesnt disappear with a time passing by.. but, same problem as with the other maps - not implemented yet. Actually once you determined that you want a road between two locations, you usually have some freedom about the exact path to choose. Straight line is an obvious choice (if it can be done, see my previous question about roads in the original post being only N-S or E-W), But even if possible, it would look like highways (!) so not very natural in Daggerfall context, and not be very exciting either. Adding a bit of randomness to the path could help with that, and stay relatively cheap to compute, even if the result will probably look illogical at times. - you probably don't want a significant tilt either, specially if the road is used for carts. If both slope and tilt should be avoided, then flatter grounds are better, no matter the direction you're traveling, that may simplify search. If a good enough measure of ground elevation is available, I wonder if an algorithm like A* would be ok. Used for each road that will probably take a while, but that can all be precomputed. I'm not sure how to experiment further. Also, roads should probably built taking other roads into account. The triangulation results in more roads than would be natural. What I mean is, if you already have a road from city A to B and there is a third city C quite close to that road, you wouldn't build roads A-C and B-C. Instead, either you would build a small road connecting the road A-B to the city C, or maybe you would have built the A-B road with a slight detour to go through C in the first place. The coming weeks I will have some time so I might give a road generation algorithm a go (just with random points, hoping that if it looks good, someone can port it to Daggerfall at some point).